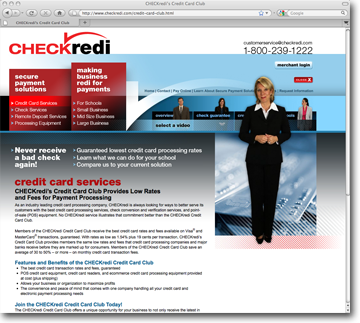 DDA designed, search engine optimized, and developed this interactive website for CHECKredi, a secure payments solution provider in 2009. Featuring 40 pages of search engine optimized content and four corporate spokesperson videos, the CHECKredi website possesses the engaging features that encourage visitors to browse and explore, and the backbone of content that will lift this site to the first pages of major search engines like Google. The multi-layered aspects of this interactive website employed the efforts of DDA's video, copywriting, graphic design, and web development departments. It is an excellent example of our full-service capabilities in website design and development.